Eye Care & Advice – How Can We Help You? Most people would not think twice about making a doctor’s appointment, or even a visit to the dentist; after all, who likes to put up with pain and discomfort? Yet people can take their eyes and eyesight for granted; it’s just as important to visit your optician to ensure your eyes are actually working as they should, throughout the many changes that happen in life. 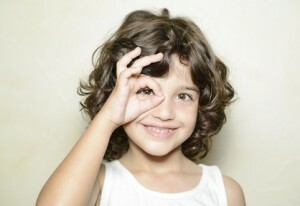 A child’s visual development is at a crucial stage between the ages of 3 and 7 or 8. This is when a lazy eye develops, and it is only in this short period that a lazy eye can be corrected. Past this stage and that’s it for life. A visit to the Opticians during this crucial developmental period is all that is needed to begin the correction process – all with the help of a pirate`s eye-patch! The use of vdu / computer screens, tablets and smart phones further adds to the strain we put on our eyes. Throughout our lives we are working more and more with our eyes staring at screens up close. Eyestrain can lead to all sorts of ailments from headaches to physical sickness. Yet a visit to your optician can help identify the underlying problem and alleviate the misery associated with eyestrain. This may be by simply advising you on changing your working habits when using modern technology, or by identifying the need for optical correction. As we age we all hit the Presbyopic – or reading glasses stage. Around the late 30’s to early 40’s our ability to focus up-close begins to deteriorate. Need longer arms? There is a much easier way though by the use of reading specs. Ready readers are cheap but they assume you have two identical eyes, perfectly round and in full focus. Alas most of us have two very different eyes. Close an eye and look at a distant object. Next change eye and notice the difference in focus. If you imagine taking a photograph with two old fashioned cameras (with negatives), one sharp, the other blurred, then if you place one over the other and look through them together what do you see? You see one blurred image! That is exactly what happens when most people put on a pair of ready readers. A lot of people would say that they see well out of their ready readers, and they only cost a few pounds. Try wearing a pair of shoes a size too big or small and see how you get on! 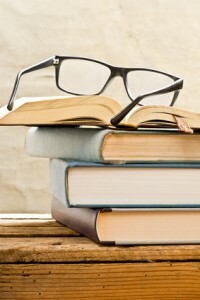 By visiting an optician you can be fitted for reading glasses which will balance the two eyes for close work so eliminating the strain that ready readers produce. Retirement is what many folk look forward to all their working life. Gardening, holidaying and simply going for nice walks is a pleasure enjoyed by many. Yet older age does have its effects on the human body. As far as the eyes are concerned advancing age brings its own pitfalls to many, including a number of eye conditions. Cataracts, dry and wet macular degeneration, glaucoma, diabetic retinopathy … and so the never ending list goes on and on. Yet a simple visit to the Optician can identify these problems at a stage when they can be effectively managed for most people. 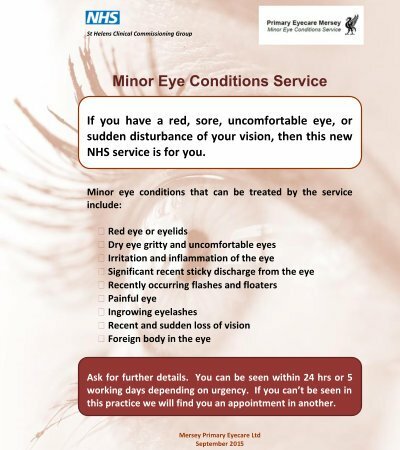 Through the Minor Eye Conditions Service scheme (MECS), Total Eyecare – as accredited optometrists to the scheme – can help with minor eye issues. You may refer yourself or have a GP referral. The sort of issues this service covers is foreign bodies in the eye, painful or red eyes, in-growing eyelashes etc. Please get in touch with us if you have an eye issue that you would normally present at A&E as we may well be able to treat you here at the practice. Note that this is an NHS scheme and as such there is no additional cost to our patients. Our dedicated team can help with every aspect of eye care, for your whole family – we’ll diagnose conditions and help to treat them, no matter what stage in life you have reached. Just get in touch with us today and we’ll be very happy to help. Total Eyecare is an opticians based in Newton Le Willows, near St. Helens, run by optometrist Nirmal Sekhon. We specialise in eye tests & eye care for both adults and children.